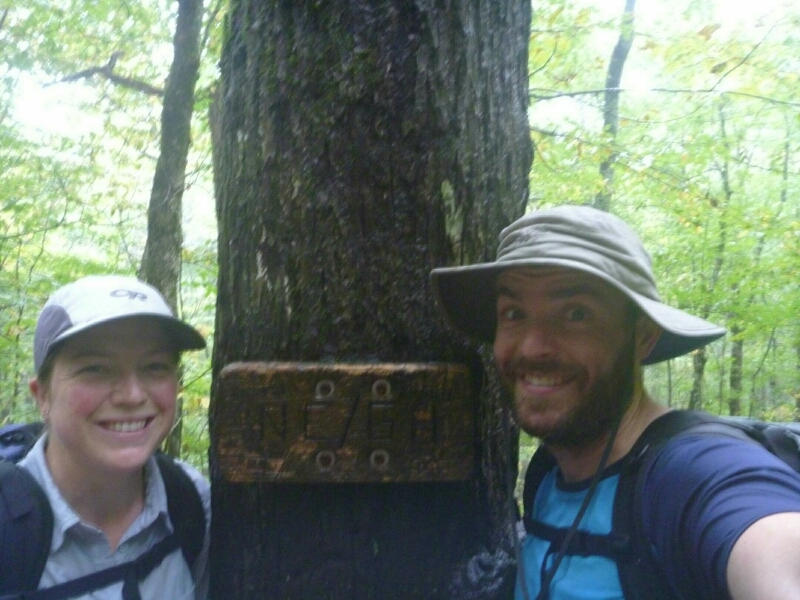 ← Day 115 – 100 miles to go! Sasscrotch, Luke, and their 4 dogs ended up setting up their tents and leaving us alone in the 16person shelter. We felt bad for them in the morning since it rained hard on and off all night. The rain and the dark kept us in our sleeping bags a bit late again but we were hiking before 8. Less than 15 minutes into the trail I was startled by 3 hounds streaking towards me, about 5 more followed – all decked out in collars with little radars on them. No sign of an owner, though. It was another soggy day – possibly even wetter than yesterday. Early in the day we summoned Mt Albert with a view of nothing – it had a fire tower but there wasn’t much point in climbing up. We split lunch into 2 so we could have 2 breaks in shelters out of the rain. 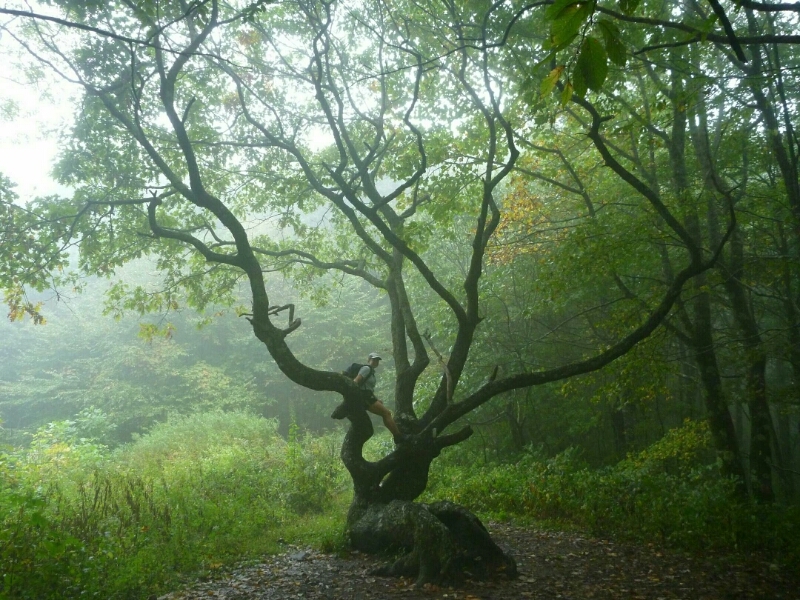 We also went up Standing Indian Mountain, but the AT skirted the summit (we were still in the clouds anyway). 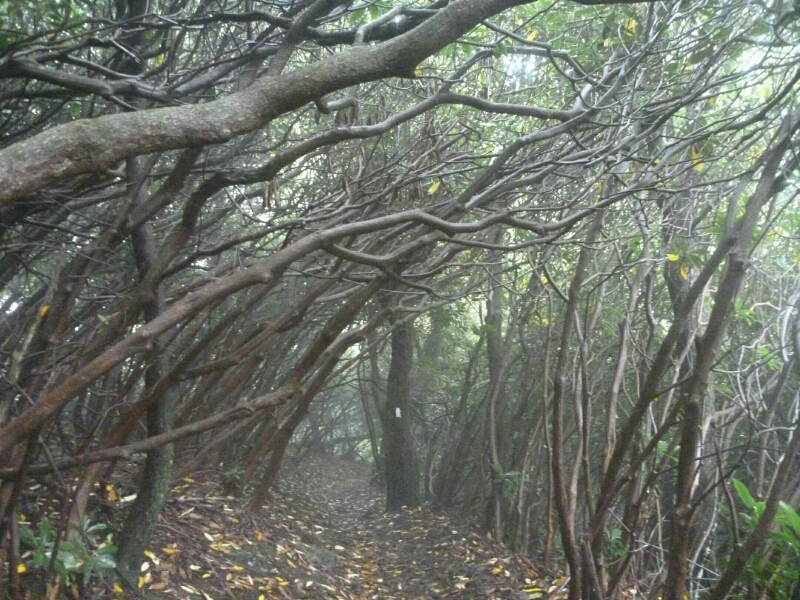 The trail was pretty fast walking today – lots of rhododendron tunnel, and gradual ups and downs. 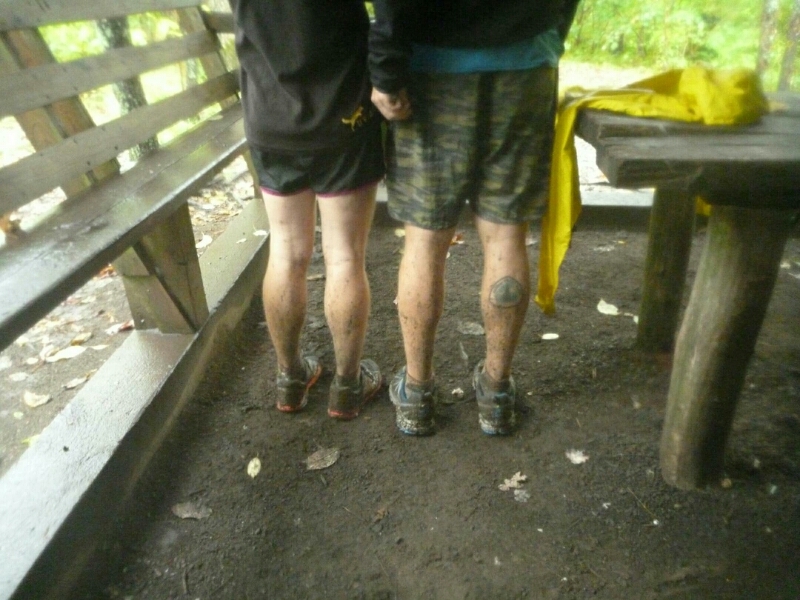 But, it was also very wet, and pretty slick in places where there was mud or rocks. We both had quite a few awkward slides and slips we recovered from. We hit our end-day goal of 21 miles at a shelter around 4:15pm, so decided to tack on another 7. It was starting to seem a bit drier around this time but that was just to fool us, it started raining and wind-raining water from the trees on us again shortly. We crossed into Georgia – our last state! – around 5:30 and got to the next shelter around 7, where we called it for the night. Long, wet day! 2 Responses to Day 116 – GEORGIA! Hope you finish in glorious sun! Loved reading your progress…. you are both amazing.